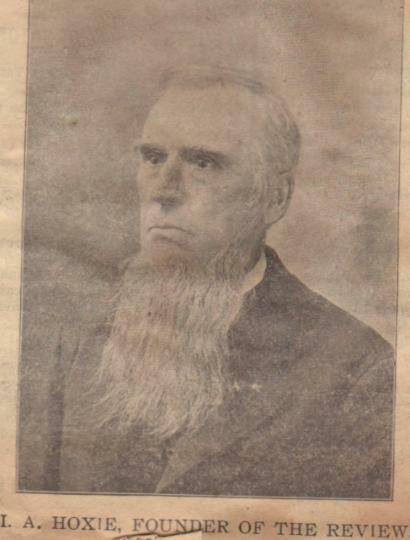 Spencer held onto the land until 1864 when he sold lot 6 to Andrew Pettigrew and lot 7 to Elnathan Sawtelle. be built. The property that is 15 West Main straddles the lot lines of lots 6 and 7. Two years later in September 1869, Bemis sold the property to Henry K. Richardson and Martin Case for $500. floor to Silas Cowell for a bakery in 1878. Cowell moved out two years later. and could do stationery, cards, and advertising, as well as the weekly newspaper. and was retiring. However, within a year, Hoxie was back as editor of the Review. business again for a year in 1880 when Elijah Robinson sold his interest in the clothing store to Hoxie. ladies hats were created, was beneath the Review office in 1886. 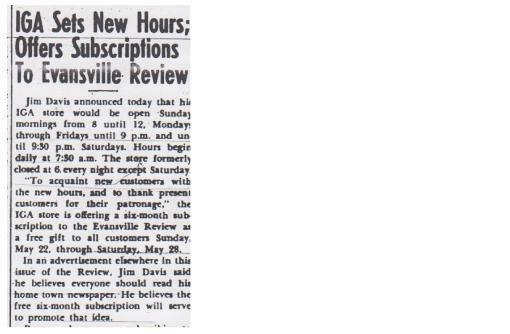 Hoxie also ran a book store with his son, Wilbur called the Review Book store. They sold and repaired books. Isaac was reported to be an accomplished book binder. Opera House block. Hoxie rented the old Review space to the Women's Christian Temperance Union. building so that the men could display their merchandise. and Voeltz. The second floor was unoccupied. agreed to put brick veneer on the front to match the other stores, he wanted the frame to be of wood. with Snashall and refused the permit by a vote of four to one. cost of $1,000. The narrow two-story building fit on a site that was 20.25 feet wide. windows. The decorative iron beam that went across the front, matched the other buildings being constructed. early occupants of the new building. They used the first floor of Hoxie's building for their clothing department. properties that he rented to other businesses. China, where it was highly prized for medicinal purposes. office. The Myron Park family moved into the flat over the Crow Drug Store in February 1921. Crow retired in 1923 and Robert L. Collins, another pharmacist, moved into the first floor of the building. store was R. L. Collins' first venture into the business world. thousand dollars income, according to the Evansville Review. Tomlin stayed in Gillies' building five years and then moved his variety store to the Pioneer Drug Store block. In 1932, the Uptown Barber Shop took over the space that had been used by Tomlin. shelves and electric refrigeration. He also offered free delivery service to his customers. The Bliven store was a success and he operated the store until March 1944, when he became too ill to work. The stock and business was sold to Jens Norum, Jr.
Bliven in the Royal Blue store. He hired Alice Peace and his wife to assist him in operating the store. sold for $1.89 according to the ads for Teubert's store. down East and West Main Street placed an ad in the Evansville Review. Main Street during store hours." Teubert's Royal Blue Store was one of the businesses listed. businessmen also asked the city for additional parking space and police protection for that parking. 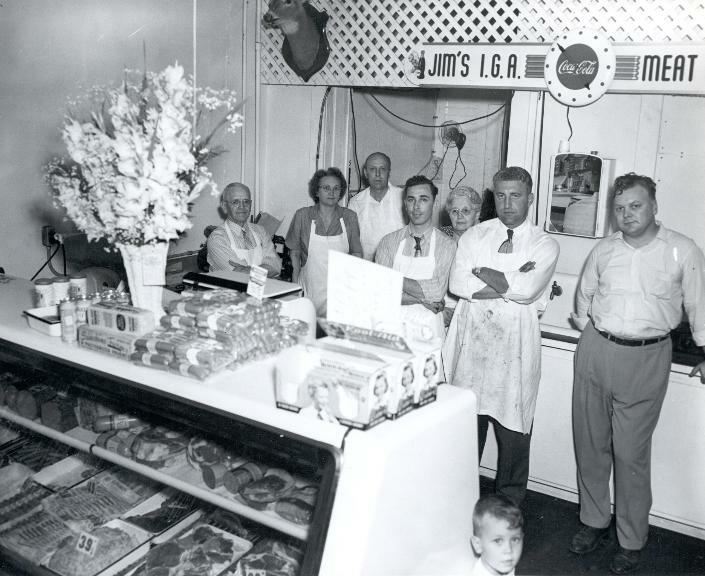 In August 1948, a new business located at 15 West Main Street in the former Royal Blue Store. Mr. and Mrs.
merchandise he had purchased from the Teuberts. April 1950 to celebrate the improvements made to the store. The building was sold to Albert H. Gill in August 1963 and since that time has served as offices for attorneys. purchasing the Gillies building at 15 West Main. He also had a law office in Footville. County School committee to ease the transition. Rene continued to own the building and she rented it to other attorneys. McBurney, Wyngaard & Wilson, shared the office with Robert Raymond in the early 1980s. portion of the building is used for office space by the Magee Construction Firm. building has had relatively few owners through the years, but has served a great variety of businesses. are unidentified. Any information about the identities of the people in the photo would be appreciated. the name the Evansville Review. front for the clothing store. put his explanation in the Review. color just a little, based on the criticism.